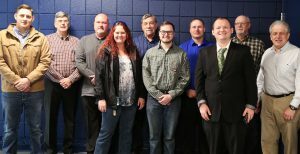 St. Clairsville, OH (April 26, 2018) — Belmont College recently held a graduation celebration and job fair which concluded the first session of a new Natural Gas Utility and Pipeline Field Skills Training Program held at Belmont College. The training introduced students to the natural gas industry and prepared them to be strong candidates to fill expanding career opportunities at local utility, midstream, contractors, and pipeline operations companies. With many open positions in the field, demand for operations crews continues to grow as pipeline build-out and replacement activities progress. At the same time, the industry workforce is experiencing significant retirements. This intersection leaves many gaps in the workforce that need to be filled. Pictured are students who recently completed the first Natural Gas Utility and Pipeline Field Skills Training Program at Belmont College: Luke Hoagland; Ed Mowrer, Energy Institute Manager; Keith McCloud; Melissa Lightner; Martin Burkey, Instructor; Audie Hezoucky; Matthew Kirkland; Jacob Stewart; Tommy Tackett; and Carl Ackerman, Instructor. Starting on March 12, the “From Black to Blue” pre-employment training program ran for four weeks at Belmont College. The program blended classroom and hands-on training to provide a basic understanding and awareness of natural gas, the natural gas utility and pipeline industry, associated equipment, procedures, and operations. At the end of the session, a job fair with regional utilities and their contractors was hosted. It proved to be an excellent channel for job candidates, and two of the eight participants have secured jobs. While the program was targeted at displaced coal workers, others in the Appalachian region were invited to take advantage of the training opportunity. Students came from a variety of backgrounds and geographic locations. The program is offered at no cost to the students, however, they are required to pay for a background check and drug test prior to beginning the program. The training program will be offered again at Belmont College starting May 21, 2018. Class dates, locations, and an application form can be found on the GTI website at www.gastechnology.org/from-black-to-blue or by calling Belmont College at 740-695-9500. Belmont College offers a variety of technical certificates and degrees in Civil Engineering Technology, Industrial Electronics, HVAC and Welding. Many of these programs contain classes specifically geared to the Oil & Gas or Electric Power industries.